A laparoscopy is a procedure which allows your physician to look directly at your reproductive organs using an instrument called a laparoscope. This diagnostic procedure allows your doctor to see problems that could not be seen with a pelvic exam, x-rays, or ultrasound. Many times a problem can also be treated during the procedure. You can usually go home the same day the procedure is performed. A laparoscope is a long, narrow tube with a fiber optic light at one end. It is inserted into the abdomen through an incision in or under the navel. It can be maneuvered in any direction to allow views of the internal organs. Additional small incisions may be made to allow surgical instruments or a laser to be inserted into the lower abdomen. When Is the Laparoscope Used? A laparoscope may be used for any of the following conditions. A laparoscope may be used to separate adhesions, also called scar tissue, which form when tissues in the abdomen stick together. Adhesions can result from infection, previous pelvic surgery, or endometriosis. They can be a cause of pelvic pain. Endometriosis is diagnosed by laparoscopy and many times can be treated through the laparoscope. Endometriosis is when uterine tissue, endometrium, is found outside the uterus. This tissue bleeds each month with the menstrual cycle. This can result in pelvic pain and adhesions. If a woman is having trouble conceiving, the physician may perform a laparoscopy to look for endometriosis and to look at the fallopian tubes. If the tubes are blocked, the egg and the sperm cannot meet. An ectopic pregnancy is a pregnancy that has implanted outside of the uterus. Most of the time, it has implanted in a fallopian tube. A laparoscopy can be used to diagnose, and many times treat, an ectopic pregnancy. An ovarian cyst, a pouch containing fluid or solid material attached to or around the ovary, can often be treated through the laparoscope, if the cyst does not resolve on its own. These cysts may be painful. Fibroids are tumors made up of fibrous tissue that can grow inside, outside, or within the walls of the uterus. 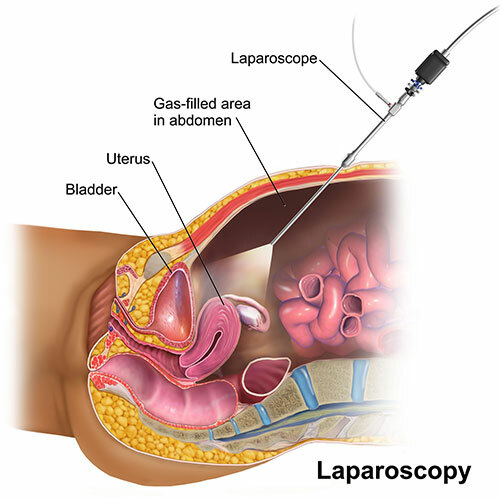 Sometimes a laparoscope is used to diagnose fibroids. What Happens During a Laparoscopic Procedure? A laparoscopy is usually an “outpatient” procedure, which means that you will arrive and go home on the same day. The procedure is usually performed under general anesthesia. You will be asked not to eat or drink anything for at least 8 hours before the surgery. The surgeon will make a one inch incision just below or inside the navel, and then will insert a needle and inject carbon dioxide gas into the abdomen. This harmless gas will lift the abdominal wall away from the internal organs, creating a space to allow the surgeon to see the organs. The needle will be removed and the laparoscope will be inserted into the incision. Other incisions may be made above the pubic area to allow other instruments or a laser to be inserted. Usually, the laparoscope projects the images onto a television screen. This makes the images larger and easier for the surgeon to see. Sometimes pictures are taken during the surgery or a video is made. After the procedure is over, the instruments will be removed and the gas released. The incisions are usually closed with a few dissolvable stitches. You will be sent to the recovery room until you are awake and alert. Following the surgery, you may have some abdominal cramping or shoulder discomfort due to the carbon dioxide gas. This will gradually go away over the next few days.